I'm here today to bring you some good news. An update on 'Code Smart'! I announced Code Smart a while ago, and many of you lovely folks have been asking how it's been progressing. Let's answer all those questions in a single blog post, shall we? Great question! First, let me start by explaining that my writing career is definitely a side project. You see, unlike subscription based learning mechanisms, books have a "spike" of income, and then they slowly trickle away. Given that I choose to self-publish, the income from the books will sadly never replace my yearly salary as a developer. For this reason, I'll never be able to "live" off the books, and they will remain a project that I work on in my spare time. For the last couple of years, I've been working for an exciting startup in the parking industry. Having made my mark on the company, I've now moved on to a new startup. In my previous startup, I was Head of Engineering, a role that meant working long hours to build the future of the company. It left little free time to work on my writing, and for this I must apologize. I'm currently working as a Lead Software Engineer over at Crowdcube. They are much better with their working hours, and the work is much less stressful for me. For this reason, I've been granted additional time to work on the books, and it's brought Code Smart back into my focus. Why not update Code Bright? Code Bright was designed for Laravel 4. Granted, much of the content is similar, but things like locations of files are different, and some deprecated content is present. I'd still like to keep Code Bright a valid resource for Laravel 4, since I know of a good many people who are still tied to that version. With every major release of the framework, I like to take an opportunity to start fresh and try some new learning methods. Having said this, I'm a developer. I don't like to repeat myself. There are a great number of chapters from Code Bright that are almost correct for Laravel 5. Writing the same content again would drive me crazy, and if you've read my books before, then you know that I'm crazy enough already! For this reason, I've decide to reuse those chapters. However, they aren't going to remain identical. For each chapter that I'll be borrowing from Code Bright, I'll be doing the following. Updating the content to represent Laravel 5. Improving wording, grammar and spelling. Improved formatting to bring the content up to speed with my modern books. Once again, these chapters will remain as great tutorials, and even greater reference material. I've taken a look at the content that can be kept relevant for Laravel 5, and have found ~300 pages. This means that the book will start with 360 pages of learning content for the new framework iteration. From here, I'll be introducing new chapters at regular intervals to cover a wealth of new and exciting features that have been introduced into the framework in recent years. I'm also approaching the intro chapters of the book from a new angle, to ease the learning process. There's a few new chapters at the start that are going to help strengthen your framework knowledge. The installation chapter has been completely re-written to work with per-project instances of Homestead, which is going to be a wonderful way for newcomers to start learning. When this title is complete, it's going to be a mahooosive whopping bookshelf-breaker of a Laravel bible. Trust me. You're going to love it! Haha! The stories were like Marmite. Some people love them, some people... not so much! For this reason, I'm going to leave the stories in the book (and write some new ones! ), but label them as a first 'sub-chapter' called Storytime. This way, you can easily skip past this content if you want to. In honesty, I think the stories are part of the learning experience. Normally, the story will be a direct reference to the component described in the chapter. It creates a memory-mechanism for learning. It's hard for a Code Bright ready to think about the routing methods without also thinking about Browsy McRequest! So when can we have it? I've almost completed the "refreshing" of the Code Bright chapters, and have written a whole new beginning to the book. So the first iteration of Code Smart will likely be released within a month or two. From here, I'll lay out a schedule for regular updates to the title, for everyone to enjoy the new and wonderful features included with Laravel. I'm sorry it's taken so long to get here guys, but I'm incredibly greatful for your continued interest in the series. 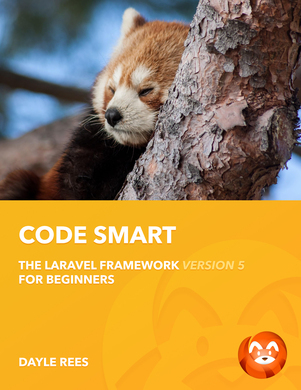 I promise that Code Smart is going to be a book worth waiting for.